» Cosafa Cup 2014: Ghana invited! Angola Cosafa Cup 2014: Ghana invited! 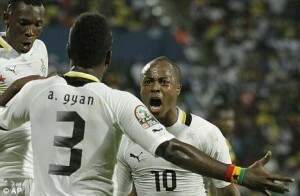 The Black Stars of Ghana will join the countries of Southern Africa for COSAFA Cup in 2014 after the GFA (Ghana Football Association) has accepted the invitation of the sub-regional organization. This year, it is Botswana which organizes from September 13 to 27 the competition whose title will be defended by Zambia. “The Black Stars who compete in the next the World Cup, have notified the COSAFA their agreement to participate in the competition. They thus replace the Comoros who withdrew and thus postulated to become the first non-southern African nation to win the final title of the tourney with 17 years of history “, a statement reads. In July 2013, Zambia beat Zimbabwe in the final to clinch their 4th consecutive title of the Cosafa Cup.